I wanted to make a seasonal, early spring cake – with fruit. Apples were the obvious choice. You can use them the same day you buy them, unlike pears, you don’t have to wait days for them to ripen, or even longer to turn dark, like bananas. They are always aromatic, even if they are imported, unlike the sour, tasteless strawberries from California, or the bland, watery blueberries from South America. How beautiful can apples look in a cake? 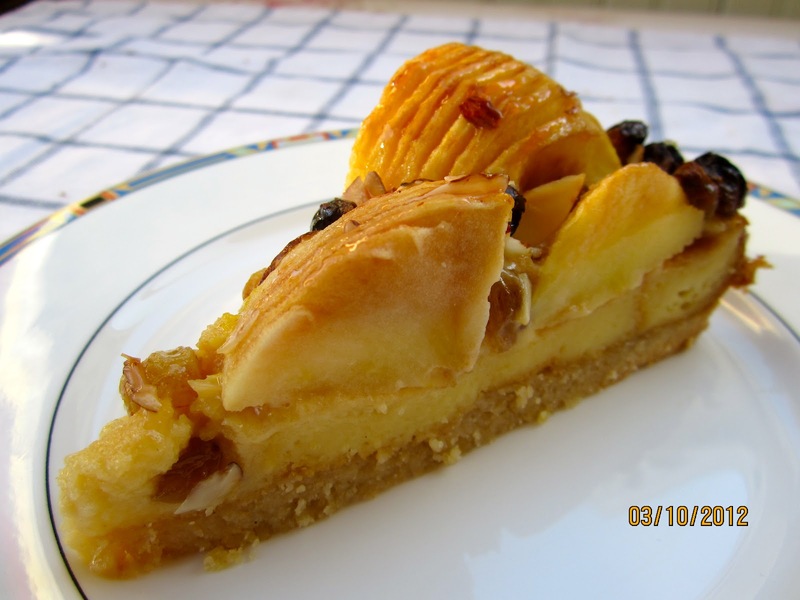 *) You can find an easy ladyfinger recipe in “The Joy of Baking” or here. For the short crust, make a ring of flour on the counter top. Place sugar, butter, salt, vanilla, lemon zest and egg yolk in the middle. Knead together by hands. (Or, alternatively, mix all other ingredients in mixer until well blended, then transfer to flour ring and incorporate by hand.) Pat dough into flat disk, wrap in plastic and refrigerate for 1 hour. Preheat oven to 180ºC/355ºF. Peel, halve and core apples. With sharp knife, cut round side with parallel cuts, ca. 1/2 cm/0.6″ deep. Pat (or roll out) short crust to cover bottom and up sides of a 30 cm/12″ springform pan. Cover crust bottom with ladyfingers. Place apple halves over ladyfinger layer, and brush with hot butter. Sprinkle with soaked raisins and nuts. In a bowl, whisk together sauce ingredients until smooth. Ladle over apple layer. Bake cake for ca. 50 minutes. Remove cake from oven, and glaze with apricot glaze. Let cool on wire rack. Cake has to be completely cooled before removing it from the pan. (adapted from Karl Neef: Sonntagskuchen und Festtagstorten – Konditorrezepte zum Selbermachen). I reduced the sugar a bit, soaked the raisins in Calvados, added almond slices, and glazed with apricot jam instead with store bought glaze. That turned out very pretty, Karin! I'm with you on the apricot glaze instead of the storebought stuff you mix with water to make a glaze. Do the apples become soft and tender after baking or do they remain crisp? Thanks, Hanaâ. I still haven't decided which American apple is best for baking. In Germany I would have used Cox Orange or Boskop, both have a very distinct taste, but get soft and tender after baking. I don't care too much for Macintosh, and had best results with a mixture of apples. But since this cake doesn't have slices but whole halves, that is not really an option. I used Jazz, but though it has a good taste, it stayed a bit too crisp after baking. What baking apples do you like best? Wow, your apple cake looks beautiful! And delicious! 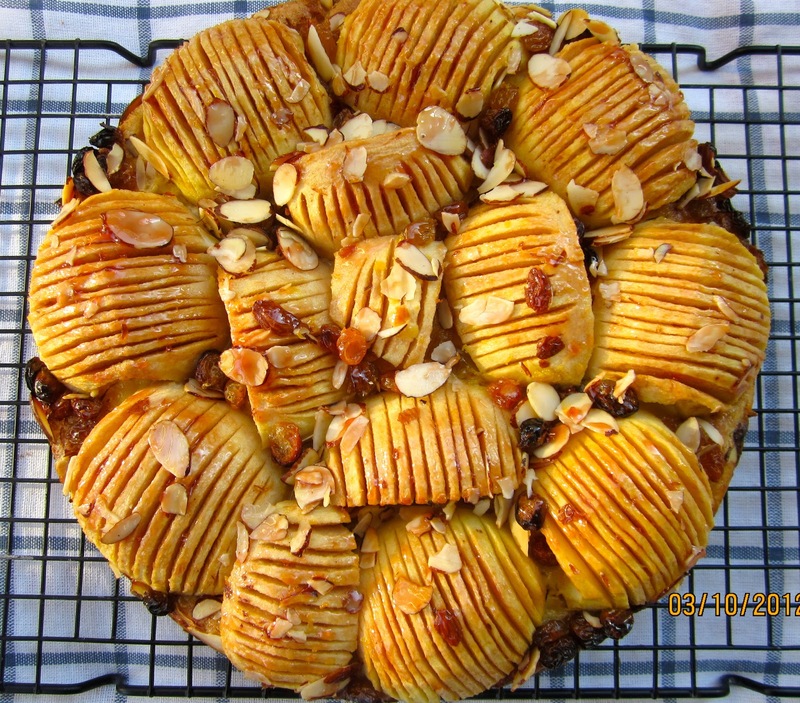 Apple Tart have been on my mind lately, bought apples a couple of times and they end up being eaten instead! hehe! This time I got to buy more and get going with the tart before the family finishes them off again! You have a whole book on apple cake, I have one book on Apple Pie!! I love apples in baked desserts! Have a nice day! Thank you! I love apples, have some in my cereal every day, and like baking with them, too. You might check out my earlier post “Apfelkuchen with Almonds and Apfelkorn” (http://hanseata.blogspot.com/2010/11/apfelkuchen-with-almonds-and-apfelkorn.html). That one didn't look so pretty, but tasted very good, too.